For something so ubiquitous during my childhood, I've never actually seen this dish in a Chinese restaurant, at least not in the good ol' US of A. So now I feel it is my duty to share this magical wonderfulness with all of you. Hong Shao Pai Gu (红烧排骨), or Red Braised Pork Riblets as I like to call them, is something that my mom used to make often when I was a child. The days those ribs found their way to the dinner table were always particularly special. Now whenever I make it back to my parent's house, it's something that I always request. The recipe I'll be sharing is, I'm sure, a total bastardization of my mom's version as she herself doesn't use a real recipe. Whenever I ask, she gives me a mish mash of ingredients, wild approximations of measurements, and instructions that are vague at best. However with that in hand, and the memories from my childhood, I think I have something that's pretty close to the real thing. Regardless, it's delicious. Some of the ingredients such as rock sugar and Shaoxing wine will probably require you to go to an Asian supermarket. Otherwise you can make some substitutions. Most Chinese dishes are served family style with some sort of rice, or less often, with noodles or steamed buns. Just keep in mind the timing if you want your rice and ribs to be done at the same time. You can easily turn this into Tang Cu Pai Gu (糖醋排骨), or Sweet & Sour Braised Riblets, by reducing the soy sauce to 2 tbsp and adding 2 tbsp of Chinkiang black vinegar. Rinse the ribs under cold water to remove any bone dust or grit. Heat up oil in a large pot over medium-high heat. Add the garlic, ginger, chiles, and star anise and fry for 1 minute, until they release their fragrance. Add the pork ribs and cook until slightly browned, about 5 minutes. Add the rice wine and let reduce for 1 minute. Add the soy, sugar, water and bring to a boil. 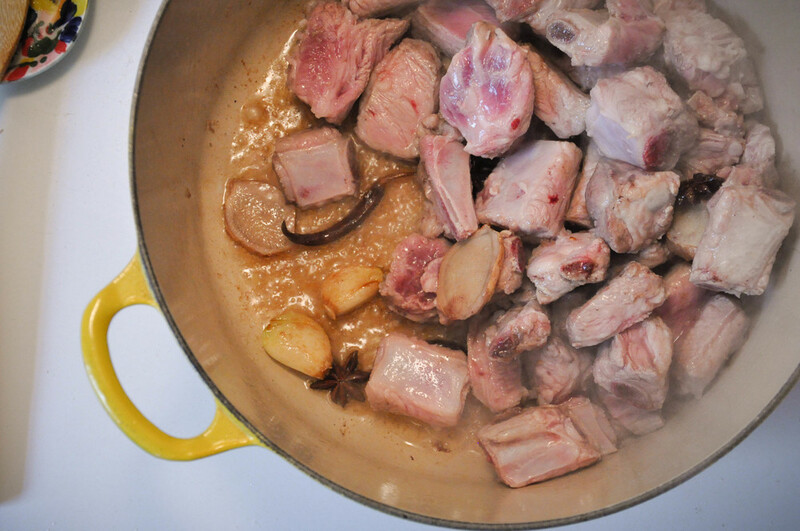 Turn the heat down to low and simmer for 1 & 1/2 hours or until the sauce has reduced down to a syrupy consistency and the meat is fork tender and easily comes off the bone. Skim off the excess fat and reserve for future use. Serve family style with white rice and (optional) some stir fried greens such as bok choy, chinese broccoli, swiss chard, etc.